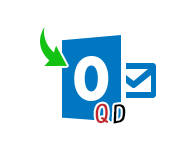 A suitable program to migrate Exchange OST to Outlook PST with attached documents. This OST to PST converter tool helps to get back corrupted or orphaned, deleted emails contacts, tasks and calendars etc. through Hotmail, Office 365 OST to Outlook PST exportation. 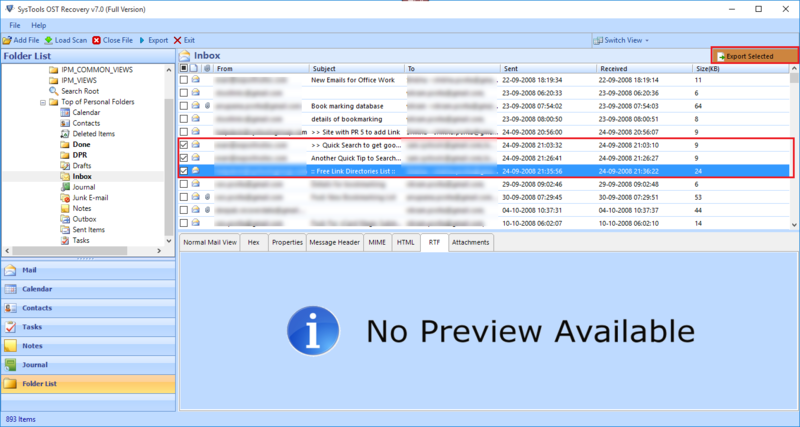 Previews all mails components like: emails, contacts, calendars, tasks etc. Export recovered OST file to Office 365, PST, EML, HTML and MSG. OST to Outlook PST Converter offers to split PST file by size during the process. Office 365, Hotmail & Microsoft Exchange OST to Outlook PST Converter works as a multi purpose tool and saves migrated data into 3 more reliable formats like: PST, EML, HTML & MSG. These functions help in moving email from Exchange, Office 365 & Hotmail OST file to PST or other email clients. Microsoft Outlook installation is required to move deleted emails from an OST file through conversion method. The software supports all latest and older editions of MS Outlook including the latest version of Microsoft Outlook 2019. OST file is Offline Storage Table file which is used to access and send emails in Offline mode. “Cached Exchange Mode” configuration introduced by Microsoft, saves a copy of Exchange mailbox in local computer using Offline Folder files. Or if user configure their Hotmail and Office 365 account in Microsoft Outlook then it will save all the data of these mail clients in OST file. This way users can work Offline even if the internet is not available. Under certain situations, Exchange Server is forced shutdown either by virus attack or server overload, that time this conversion can be performed to access emails. 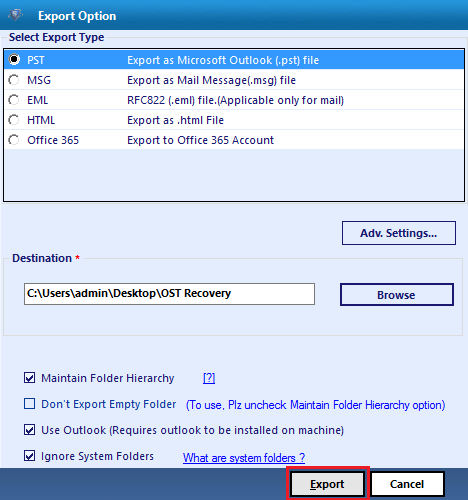 To recover corrupted OST files as well as permanently deleted emails, contacts, calendars, and tasks from an Exchange OST file, user can use Exchange OST to Outlook PST converter tool. However, direct access to OST file is not possible due to security on an OST works to eliminate Windows NT authentication when you work offline. In case if the original Exchange profile is modified or default location of OST file is changed, that time OST file turns orphan and needs a conversion solution. In the case of Hotmail and Office 365 OST file, the direct access of data is not possible. Hence, if the file get corrupted it will require Hotmail or Office 365 OST to PST conversion. There are two different methods using which a user can create PST from OST file. If you are able to sync data from the Exchange database that time you can directly move OST file to a PST file. If your Office 365 or Hotmail OST file is corrupted or you are not connected to the Exchange server that time the above mentioned methods may not work. This necessitates OST to PST conversion tool to move offline corrupted, damaged, or orphaned OST file to a healthy Unicode PST file. This tool also helps users to recover damages OST file of Office 365 Outlook account or Hotmail database. Free OST to PST Converter export only 25 Items per folder. Step 1: Before moving on process, Download and Install the tool. Click on Add File button to open your input file. 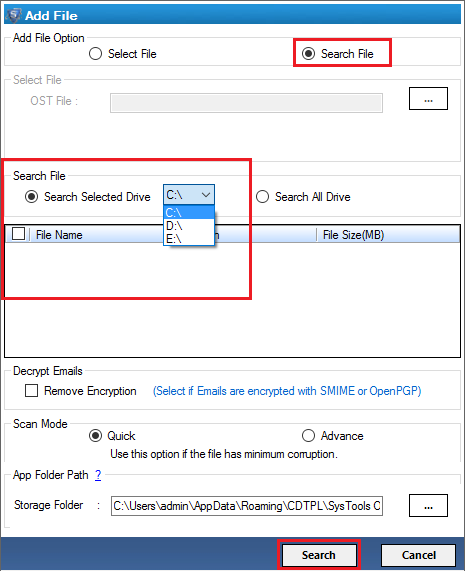 Step 3: Select "Search File Option" to find ost file in selected drive. 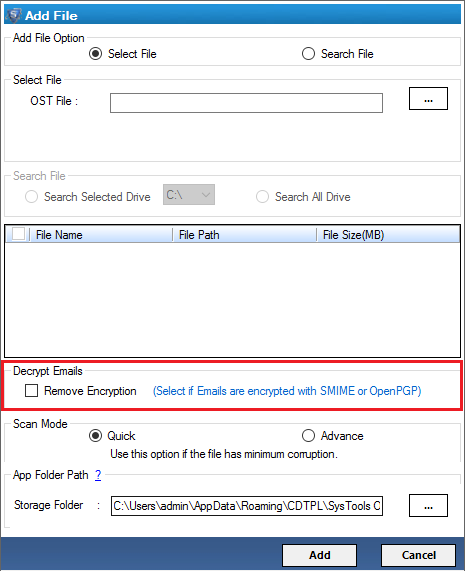 Step 4: Remove Outlook Email Encryptions SMIME and OpenPGP in OST files. Step 5: Choose "Scan Mode"
Step 7: Save Scan OST File. Step 8: Export Selected OST Emails. Step 9: Click on "Export" button to save the showing file items. Step 10: Software will start the exporting process. Step 11: Export Process Has Done. Does this OST to PST converter software support recovery of permanently deleted items from OST file? Yes, if the items are permanently deleted from the OST file, the software supports its recovery. For this, choose the 'Advance Scan' option in the tool. How many times can I use this tool to convert Exchange OST to Outlook PST? Once you invest in the tool, it can be used as many times as you want. The software move unlimited number of OST files into PST. I cannot enable the naming convention option in the tool. Why? The naming conventions are applicable only for MSG and EML files. If you cannot enable this option, possibility is you have selected 'PST' as the output data file. Do I need Exchange Server set up for OST to PST migration? No, for recovery and migration of data from an OST file to PST, the software does not require Exchange Server installation on machine. However, MS Outlook installation is mandatory to run the tool. I am using Outlook 2010 on Windows 8. What is the location of OST file? Does this software also convert the OST file created by Office 365 & Hotmail Outlook account? Yes, this tool is proficient enough to convert Hotmail OST to PST or Office 365 offline created database file. Just save the file in local machine and migrate them in the required file format. Using QuickData OST to PST Converter at first was a risk I had taken. But I am glad after taking the risk. The software worked exactly the way I wanted it to. There were no hassles faced and the least amount of end user efforts were involved to my surprise. Thanks to the entire team of QuickData for this tool. OST files on my system were of no use anymore as the project I was working on was finished but I wanted to make sure that they are archived properly, I wasn't able to trust OST for that job! Luckily a client of mine suggested this convert Hotmail OST to Windows PST application and that's how i turned into one more happy customer of QuickData! There had been a lot of confusion as to how do I get rid of this Exchange connectivity issues that I was facing since a few days. I was planning to switch but didn't quite know, how to proceed. Thanks to Office 365 OST to PST conversion for being an apt rescue. I was just looking for a tool like this, no dependency!